January 9, 2013 By Allyson 23 Comments This post may contain affiliate links. Read my disclosure policy. When I was in college, I spent one summer working at a popular Mexican restaurant in my hometown. At that point, I didn’t really know much about Mexican food, aside from that I liked pretty much everything I had tried. During my training period, I had to learn about all the food on the menu, memorizing all the ingredients, what everything was, what it was served with etc (if you have worked in a restaurant, this is likely a familiar process to you). Flautas, Chile Rellenos, Tamles, Flan…everything was delicious, and it was rare I came across something I didn’t enjoy. After a couple months of working there, they decided to feature a limited time ‘special’ dessert. 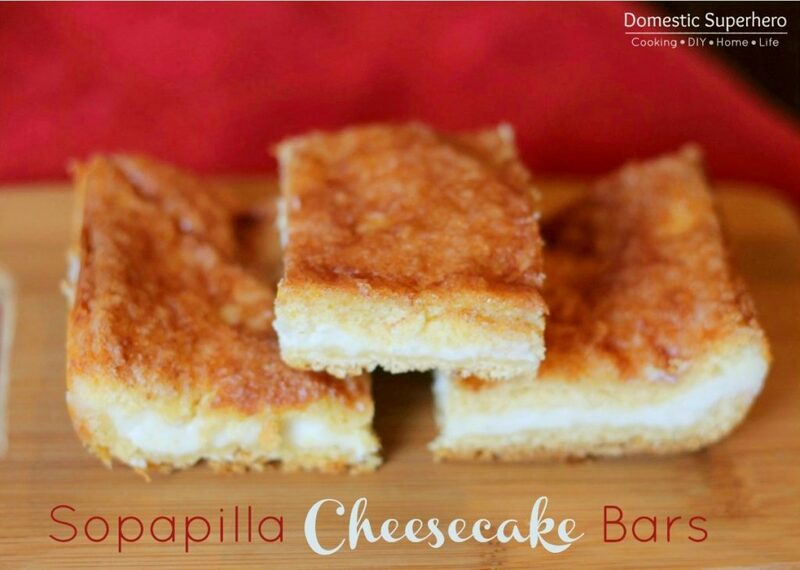 This was the first time I had heard about Sopapilla cheesecake….a mexican spin on cheesecake. This dessert is incredibly easy to make, and affordable, and they are delicious. Hosting a party? Pair this with some Mexican Baked Eggs or Black Bean and Potato Enchiladas and be on your way! 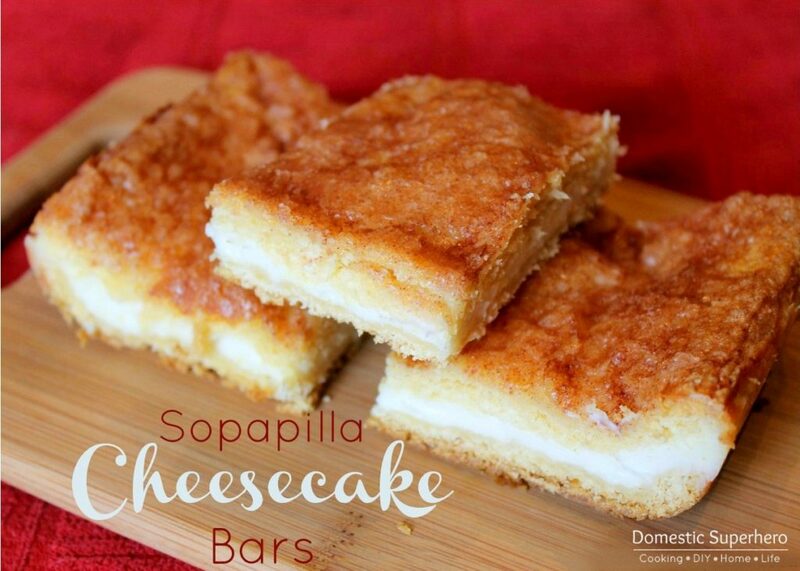 These Sopapilla Cheesecake Bars are the perfect addition to any fiesta! I have lightened up this dessert by using Neufchâtel cheese in place of cream cheese, but you could also use cream cheese. In my opinion, if didn’t make any change on the taste. 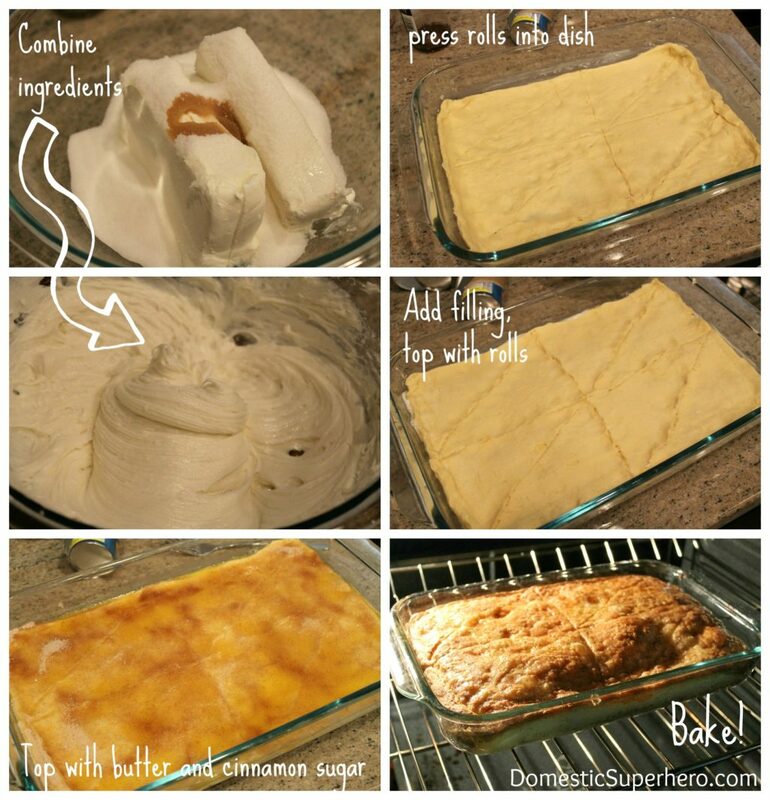 Unroll 1 can of crescent rolls and lay flat in the bottom of a 9×13 baking dish. Stretch the rolls to cover the bottom of the pan. Pinch any seams closed. In a mixing bowl combine Neufchâtel cheese, 1 cup sugar and vanilla until combined and smooth. Spread the mixture over top of the dough. Unroll your remaining can of crescent rolls and lay this on top of the cheese mixture, again, pinching closed any open seams. Pour your melted butter on top of the crescent roll. In a bowl mix the remaining sugar and tablespoon of cinnamon together and sprinkle that evenly on top. Bake for 30 minutes until top is golden brown. Let cool for approximately 20 minutes and then put in refrigerator to completely chill before cutting into squares. Serve cold, or warm up individual slices for 10 seconds in the microwave. Enjoy! Neufatchel cheese is just like cream cheese. I can taste like no difference, yet is has 50% less fat than regular cream cheese. I literally use it in everything that calls for cream cheese. If you have Kroger, they have it right next to the cream cheese…it looks JUST LIKE cream cheese, in the box, but it’s called neufatchel cheese. You should definitely try it! ooooohhhhh!! I’ve had these at a party before and they were SO good… I’m drooling just looking at your pictures! You should totally make them! Thank you, Amy! I stopped by your blog and FB page and love it!! YUMMO WOW these look sooo good! Thanks for sharing! It’s “neufchâtel” cheese. It’s named after Neufchâtel en Breyer, France. I just finished baking the sopapilla cheesecake bars. It says to refrigerate it approximately 20 minutes after coming out of the oven. But do I put it in the fridge covered or not? Thank you. Can these bars be put in the freezer? I don’t think so Connie! I would worry the pastry would get soggy when it defrost! They do last quite a while in the fridge though, or you can make a smaller batch in a smaller baking dish!